Learning how to measure soil water infiltration. As the world starts to take stock of more than just carbon in forests, WeForest builds on our forests and water training programme launched in 2017. 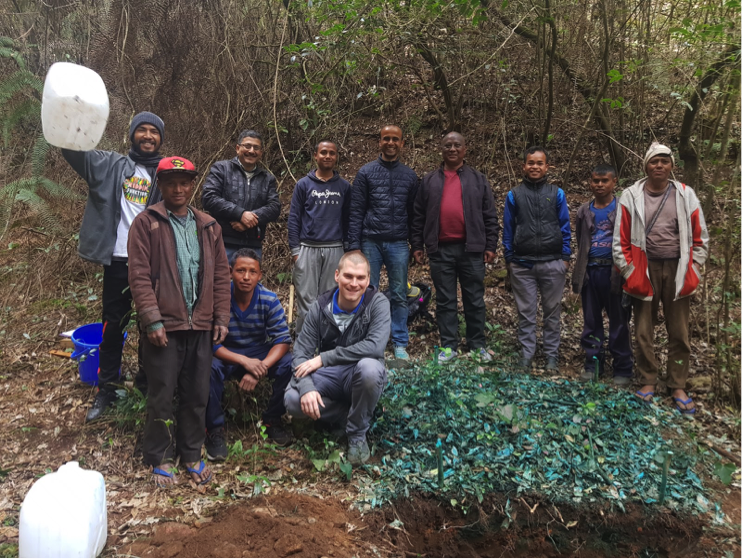 This ongoing adaptive and interactive programme will enable local forest stakeholders to manage their forests for water and will advance the science surrounding forest-water interactions. For an area dubbed the ‘wettest place on Earth’ it may seem unimaginable that the Khasi communities of India’s Meghalaya state face periodic water shortages. However, this is now their reality as high historical rates of deforestation and land degradation have contributed to a decline in the hydrological functioning of the Umiam river watershed. Forest and water processes are intricately linked; this fact is widely recognised not only by the international scientific community but also by local forest communities like the Khasi. Significant loss of forest cover and species diversity can reduce the movement of water through soils and increase water lost through surface runoff and evaporation from bare ground, resulting in reduced dry season water availability. WeForest has been working with the Khasi Hills Federation to restore native forest and improve local livelihoods since 2014. More recently, we have begun to address concerns raised by the community and the Federation about water scarcity and declining water quality in the East Khasi Hills area. During April 2017 in Khasi Hills, WeForest launched a forest-water capacity building programme. This programme, delivered in collaboration with FAO, aims to build local capacity in forest-water management and monitoring2. The programme is a key element of our ongoing commitment to further the International Forests and Water Agenda, and advance knowledge on the forest-water-climate nexus through undertaking applied research. Our first capacity building workshop saw WeForest and FAO experts, local government officials and University staff join the Khasi technical and community teams to strengthen knowledge on local forest-water processes and to develop an integrated forest-water management and monitoring plan for the area. The workshop was well attended and well received by all - there was also time to put theory into practice by installing rain gauges (to measure rainfall) and collecting data in the field3. “The workshop was a knowledgeable one; I learnt about the forest-water relations, how to monitor and how important are forests not only to humans and wildlife but to water as well, which ultimately is the basic need of humans” • Khasi Hills Workshop Participant (April 2017). Since then, we sent a small science team of two forest hydrologists back to Khasi Hills during February 2018 to follow-up on last year’s workshop. This time the focus was to expand the technical capacity and field skills of the Khasi Hills team in measuring and reporting key forest-water indicators. The Khasi technical team were given extensive hands on training in using infiltrometers to measure the rate of water movement through soil, collecting soil samples for lab analysis and conducting dye tracer measurements to look at water movement pathways and patterns through soil. The data collected during this intensive 8 day field training session will contribute to ongoing monitoring efforts and will also help to guide further restoration activities in the area. Fieldwork wasn’t without its challenges as the team encountered steep slopes making carrying equipment difficult and taking measurements in shallow degraded soils proved difficult at times. However, the feedback received from the team was very positive - it seems field training is an effective way to help reinforce knowledge, instill confidence and boost the team’s enthusiasm for new activities! WeForest will continue to work in collaboration with the communities and the Federation of Khasi Hills with further workshops planned in the near future. We are also expanding our programme to organise a forest-water capacity building workshop in Ethiopia. This workshop will be delivered in collaboration with FAO and with the support of GIZ during June 2018.